This lovely plant was given to me by one Kay Dunlop, who is irrefutably the doyenne of tender Salvias in this part of the world. I had previously been impressed by the beautiful Salvia corrugata at Logan Botanic Gardens and it goes without saying that I was quite delighted to acquire it from her. The flower is an amazing shade of blue, which I for one find impossible to capture with a camera. 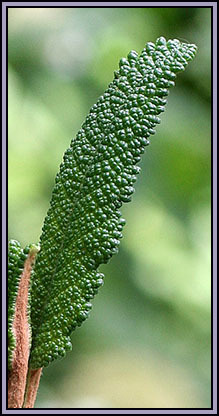 The foliage is also noteworthy and gives the plant its specific epithet 'corrugata'. 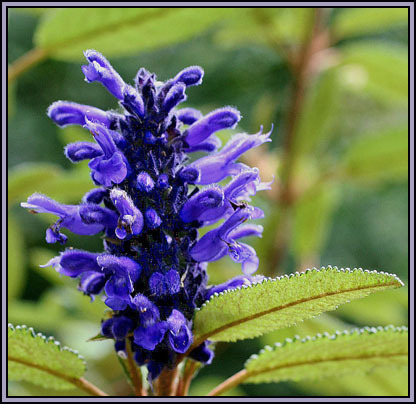 The Salvia is to be found high in the mountains of Colombia, Ecuador, and Peru where it grows as a shrub, attaining a height of up to three metres. In cultivation it is usually found to be smaller in stature. It flowers late in the year and with me it is still busily flowering in late October. The species is said to withstand several degrees of frost but it ultimately succumbs to the cold, wet soils of winter when planted in the open garden. I grow it in a ridiculously small earthenware pot in a sandy, gritty soil mixture which was once John Innes no.3 but by now must be totally bereft of any significant nutrient. The pot is situated in an open sunny spot which is probably the hottest part of the garden in summer. My theory is that the impoverished soil and the cramped condition of the root ball turns out to be conducive to flowering. You could call it tough love I suppose. Nevertheless, as a matter of insurance, it's worth taking a few cuttings in late summer or early autumn. They will root very easily. There exists an intriguing account of how Salvia corrugata came to be introduced into cultivation. 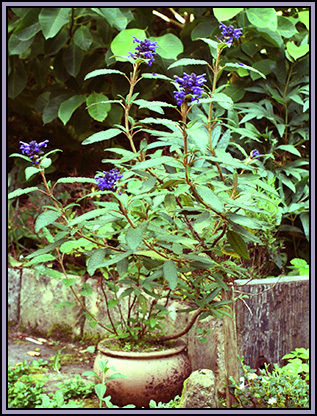 In 1988 Jim and Jenny Archibald collected an unidentifiable Salvia during their expedition to South America. They passed on several herbarium sheets to the Edinburgh Botanic Gardens for determination and these sheets were routinely freeze dried as a matter of best practice. In 1995 the sheets were examined by James Compton and in doing so he accidentally dislodged several of the seeds. He decided to sow the seeds, more in hope than in expectation. But nevertheless some of the seeds did indeed germinate and it is believed that nearly all existing progeny of this species that are currently in cultivation can be traced back to Compton's tentative 'experiment'. Its a good story and is fully documented by Betsy Clebsch, a truly impeccable source.